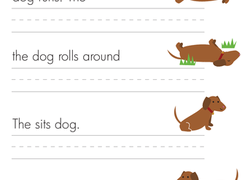 Our printable sentence building worksheets are perfect for kindergarteners who are learning how to form complete sentences aloud and in writing. These worksheets offer opportunities for students to write sentences for fiction and nonfiction, orally practise storytelling, complete sentences from prompts, and more. Assess kids' understanding of ending punctuation in this worksheet. Determine if students know when to use exclamation points, question marks, and periods!